Fans of Tales of Vesperia have long been awaiting a release of the Definitive Edition of the 2009 Japanese RPG in the west. Bandai Namco have today announced that the game will be released this winter and it will be coming to Nintendo Switch along with PS4, Steam and Xbox One. Although all we have is a brief trailer, the title suggests that all of the extra content in the Japanese version will be included in the game. Is this one you've been waiting for? Let us know in the comments below. Might not be the exclusive one thats meant to be in development, but hey. More Tales is more Tales. Day 1. I've been needing a fresh JRPG. Day one. One of the few I never owned. Yasssssss!! I'm going to pee on ALL the trees!! Awesome! Of all the Tales games, this is probably the one I enjoyed the most. Day 1 for me! Also . . . shouldn't the article's subtitle be "Tales of Finallia"? one of my all time favorite tales !!!!!! My body is ready. My wallet is not. will get this for sure!! I have heard good things about the Tales games over the years. Always meant to get into them, never did. Unless someone tells me I need to have played other games in the series (do I?) I think I will absolutely pick this up! This is THE best Tales game ever made. Pinnacle of the series and often rated among the very best RPG's of all time. I originally bought 3 RPG's for Xbox One in hopes of Backward Compatibility. @JaxonH This comment makes me even more excited than the announcement. I have never payed a Tales game but always meant to, since I love JRPGs and have heard good things about the series over the years. Just to confirm, this is a stand alone story? I don't need to have played another Tales game first? Yes. Completely separate. The only continuance I'm aware of is Tales of Xilia/Xilia 2 and Tales of Symphonia/Symphonia Dawn of the New World. This one has been stashed away as an Xbox 360 exclusive since it came west, so this is the first chance many people will have to actually play the game. @JaxonH Good to know. Thanks! Oooo I've never had a chance to play this one before. Easily one of my favorite announcements from a great XBox presentation. Awesome news for an awesome game, still I want the next Tales to be brand new though but Vesperia I take any day until then. Now if only they give us the Phantasia, Symphonia 1 & 2, and Graces F remastered for Switch later down the road I would forgive Namco for betraying the Wii. Oh, my goodness. This is one I’ve never played, but by gum, I’m gonna play it in my Switch! I’m thrilled to finally check this one out! The trailer looks really good. I'll be picking this one up. @Heavyarms55 @JaxonH There's also a few games that share the same universe and story. Symphonia takes place about a thousand or so years before Phantasia; Destiny and Destiny 2 (Japan only) are connected; and more recent games, Beseria takes place before Zesteria. All these games can be played stand alone, but definately can get that feeling of "whoa!" when u make connections. All are fun, and should be given a try sometime! @invictus4000 Well it's not fresh but it is a good game. The only Tales game I ever played was Hearts R on the vita. I didn't really care for it too much. How is the rest of the series compared to Hearts? @NESlover85 What did you not like about Hearts R? @Crono1973 The story was kind of meh, combat was a breeze until the end of the game where the difficulty seemed to ramp up, and there wasn't much to explore on the world map. Wow, the main character is either an extremely feminine looking guy or an extremely flat-chested girl. I played the original. It’s ok, kind of drags a bit and it doesn’t have the good battle system. Rather weird one to do. It does kind of make me wonder if the game industry makes games any more or just ports the previous gen’s games endlessly. Yes. I love tales game. This is the one from Xbox 360. I owned it but only played 30 minutes of it because I gave my system to my nephews. My brother is a meager man. He and his wife keep spewing out children. So I thought they would enjoy the Xbox. After all, I was working on my Bachelors and did not have the time. I always wondered about this one. I played the heck out of this game on 360 with my bro back in the day, it really is an excellent game. Highly recommend it for those who have yet to play it, especially since the battles can be played co-op. @JaxonH Those where the games I owned for the 360 too. Blue Dragon and Lost Oddessy were amazing. This is a day one pickup, no questions asked. Nothing will beat Symphonia, for me, but that doesn't change the fact that a Tales game is on the Switch. December can't come soon enough! The best Tales IMO. So happy it's coming to Switch! So long as it releases physically and at the same time as the other versions. That's cool stuff I remember having Tales of Symphonia for GameCube, pretty fun! Yes! This is awesome! I haven’t played this game since I got rid of my Xbox 360 after the red ring of death. Also a 2018 release, damn. Second half is going to be packed. I'm not too big on this series, but I've heard many people say that this is their favorite in the series. Maybe I will give it a shot. Of all the Tales of games I've played I think this is the only one I like more than Symphonia so far. And I never got the chance to finish it! Will def be aiming to correct that on Switch, Day 1 for me. Yes! Ive been waiting for this for ages! Vesperia on the X360 always felt like it was missing stuff and always held it against Namco Bandai for their silly reasoning for not brining the PS3 version West. My favourite RPG ever made, I kept my xbox 360 for this one game. Day 1 purchase from me! @BulbasaurusRex Yuri is not very feminine/flamboyant. He just has long hair. Oh this is super hype, I've always wanted to play this game but never got around to it on 360... This on Switch will be perfect! None of the games in this series has ever really clicked with me besides Symphonia, but I'm definitely willing to give it a chance. I never played a Tales game, but this looks like a good start. Gotta love the JRPG goodness the Switch is getting in 2018. Always hate those Japanese games with too much anime videos in trailer with no or little gameplay included. Surprisingly this one shows enough gameplay and looks enjoyable. Might pick it up. @Aerona I think Vesperia is the best all around game in the series. Individual games have parts that are better but Vesperia is, in my opinion, the one that has everything working best across the board. So, as an example, imo Symphonia has the best story in the series. As much as I love the game though viewed without nostalgia everything else is a little creaky -the combat doesn't compare favorably to more modern games, the graphics are... actually the graphics themselves are fine, it's the animation of them that's clunky. Most of the Tales games have parts that don't quite work for me (I miss overworlds in the new games so, so badly ) but Vesperia, and to an extent The Abyss, seems to straddle everything the best. Would definitely reccomend. @TommyTLG He has long hair worn like a girl and a very feminine face. I didn't say he acted like a girl, just that he looks like one. Again, I find myself torn between my love of JRPGs and my lack of interest in 12-year-olds and talking animals. My brother got a 360 back in the day to play FIFA; we only had Nintendo consoles in our house before then. I had loved Symphonia on Gamecube and the GBA re-release of Phantasia, so of course I got Vesperia. But I've always felt cheated that the game was made for 360 specifically, only to later launch a Japan-only PS3 version that added additional party characters (including the Pirate girl and the best friend/rival knight). This trailer clearly shows that it's a remaster of that latter, more complete version. I'm so psyched to play this on Switch. Haven't played a Tales title since The Abyss was ported to 3DS. Been hungry for a handheld RPG. I almost gave in and bought the bland looking Earthlock. Yet another reason to resist and be patient...this along with Shining Resonance and Octopath are going to fulfill me for the rest of the year, I'm certain. @Heavyarms55 You don't need to play any other "Tales of" if you want to play one even though some are connected somehow. I like the Tales series... I may bite. Definitely intrigued by this one. I've heard good things about the Tales Of series but never have played any of the entries. I have played through most of the Tales of series and Vesperia has the best cast, best protagonist and definitely one of the best stories. Even its anime movie prequel is awesome! Been waiting an eternity for the PS3 version of this game to be localized and now we get an HD remaster for the Switch! This is announcement is almost as crazy as an announcement would be for a Shining Force 3 complete remaster! Bamco's been stepping up lately! Happy to see this come to Switch. Will definitely buy it on that system!!! Now this makes me happy. Keep the RPGs coming! Yay! maybe I'll beat it this time. I loved Tales of Destiny games, but had trouble getting into Tales form the Abyss on 3DS, however liked the anime they had for that series. I will definitely be giving this one a shot since i've been going through a renaissance for me playing RPG's again. Currently working on Persona 5 and have Y's VIII coming end of the month. Have it still on my 360. Never finished it. Mechanically, a great game. But unlike Symphonia, I just couldn't connect with the story or characters and playing these kinds of games, it's a biggie. Maybe this DE will make a difference? Almost considered buying a 360 just for this game, good thing I put it off for so long! or at the very least, a few more ports. @BulbasaurusRex I also love how some of the NPC's at the start of the game mention that. The game is self aware. Looks kind of bland - but everyone seems pretty positive about it, so I'm interested. For anyone reading, why the love? I'm glad Switch is FINALLY getting a Tales of game! I want to get it Vesperia on Switch BUT!!!!! If there is a collector's edition I fear the Switch will not get it. That would be terrible for myself as I love getting Collector Edition for all the Tales of games. @piojito_O SAME HERE!!!!! Oh my goodness. To buy a 360 just to play Tales of Vesperia...I'm so glad I didn't do that either. Now, our patience has rewarded us with Vesperia coming out on the Switch! Yes! The only game I've played in the tales series was Tales of Symphonia which was great. Really like the look of the over the top special moves, am sure it will be great. Hmmm not sure yet if I will get it for PC or Switch. If it is a solid 60 FPS in handheld(a man can dream) then I will definitely get it for switch. If it 30fps in handheld and 60 docked then it is a tough desition. If it is 30 for both then I will get it for pc. Still it is fantastic that it is coming to the switch anyway cause more people get to play this awesome game. Really cool to see this coming to the Switch but wonder how good it will run/look on less graphic intensive system compared to the rest. Wow what a surprise. I'll pick this up on the Switch. I keep hearing about Symphonia, Abyss, and Vesperia are some of the best tales of games. I'm hoping the story is actually somewhat good. I've never gotten into a tales game proper because despite how good the gameplay is I can't put up with the mediocre 6/10 stories/characters that think they're an 8/10 at least. I tried getting into both abyss and Xillia but I found both to be pretty cliched from a narrative standpoint, with Xillia in particular having boring predictable characters, plot lines, and a pretty weak villain. @Oat Tales of vesperia is REALLY good. I am actually kinda sad I have already played and completed it on 360. U r in for a treat! I remember the first time I played VESPERIA I thought it looked STUNNING. This is great news! @Oat Tales of Vepseria and Tales of Symphonia are the probably the best of the series. While the story is a matter of taste, the combat of these JRPGs is what make sure them stand out. Where else can you find a JRPG with great single player experience with the option to have co-op in combat? Will be buying if they include original voices and music. If not, I will think about import. As long as it keeps the tales rules of multiplayer and not forcing me to play as the generic lead, I’m in. So far this and Starlink with Star Fox have been my favorite announcements. Sooooo looking forward to this! I’ve been really itching to cause 30000+ damage to something. Although it'll likely be years before I get to actually play it myself. Which other installments did you enjoy? @piojito_O I'm SUPER backlogged! T__T At least 20 games on the 3DS alone. Several original Wii, Xbox 1, PS4 , PS3, WiiU and Switch games backlogged. What makes this more hard is that several of those games are RPGs. Hahaha. I have Tales of Berseria Collector's Edition but havent even tried it yet. I want to finish Zestiria and Alisha's DLC story before starting Beseria. 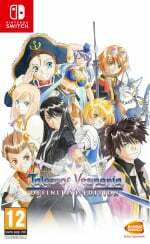 Tales of Vesperia..so many people said it's the best of the series. I cant wait to play it and make my own opinions about it finally. I may push off Zestiria and Beseria to the side, just to play Vesperia. We will see. What Tales of games have you played and liked? Every Tales of game seems solid.